This is a pretty illuminating chart from JPMorgan. 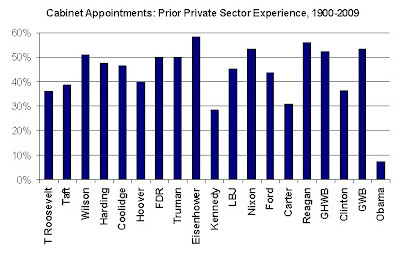 It compares public versus private sector experience of cabinet-level appointments by presidents, going as far back as Teddy Roosevelt. It's quite relevant in an environment when we have $787billion stimulus packages that aim to "create or save" jobs, a term that literally has no meaning. This administration's appointments have less than 10% of their prior experience in the private sector, versus a previous average over 40%. Not surprising to see that their ideas have not translated into actual jobs, seeing as their experience has been largely inside University walls.